It only seems right to be drinking something American on their Independence Day, and happily Shepherd Neame have provided an ideal beer in the form of their latest import from Samuel Adams. 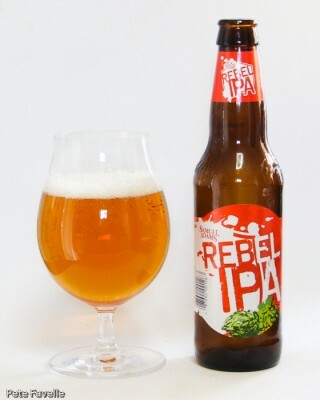 Rebel IPA is a 6.5% all-American IPA; fairly mid-range in terms of strength. It’s a pale copper ale, with little in the way of lingering head on it. The nose is nice enough; sweet toffee and pine needles but without the big floral aroma you might expect. In the mouth it’s a similar story – sweet and rich with a nice resin-y background providing some decent but controlled bitterness. There are hints of lemon citrus and the finish is long, and overall it’s a well balanced, refined IPA. I’m conflicted on this beer; it’s a very tasty, restrained American IPA – pretty much what I’d expect from someone like Samuel Adams. On the other hand, the whole “Rebel IPA” branding made me expect something brash and bold – a hoppy assault on the senses which it just isn’t. Look elsewhere for a juicy banger – if you want a refined IPA though, you could do a lot worse. 3.5 stars. Many thanks to Shepherd Neame for sending me this to try!